I must say that I am becoming more adventurous when trying new beers. But this week's choice, Rosée d'hibiscus by Dieu Du Ciel, has me nervous. I have had flavoured beers before, flavoured with fruit, though, sometimes spices but not one flavoured with flowers ... hibiscus flowers to be exact. Beer that smells like flowers to me is something which does not go together. Dieu Du Ciel microbrewery seems to disagree. That first sniff when I pour the first glass should be interesting. 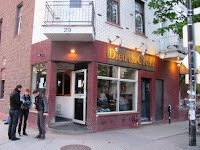 Dieu Du Ciel is a microbrewery located St-Jerome Quebec. 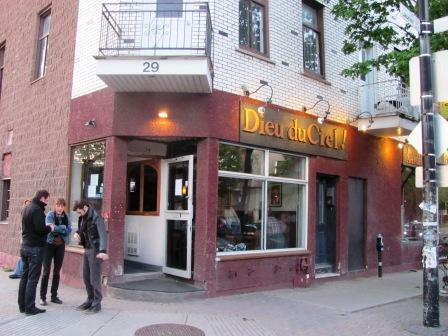 They also have a brewpub Brasserie Artisanale Dieu Du Ciel in Montreal. No ordinary brewpub either as his brewpub was named the 2010 best Brewpub in the World by Ratebeer. No small feat! In May, Teena had a business trip to Montreal and asked me if there was a spot she should visit. I did a search and, sure enough, found this place for her. I did not put the two together until she saw the bottle today. Her review of the brewpub is here. Opened in the mid 1990s ,they have their "Via Dolorosa", or Act of Faith Statement, "From the time it opened its brewpub on Laurier avenue in Montreal, Dieu du Ciel has been aiming to brew the best beers possible, without compromise, to bring you a unique, intense tas ting experience. No matter the production costs, the demanding labor and the many difficulties that came with the production of beer, our first motivation is to always bring you original, satisfying beers. We love beer, and insist on showing it in the ones we brew. We scorn the latest trends and brew beers that seduce us primarily by their intrinsic qualities. We want to always remain creative by constantly experimenting new recipes and creating new beers. They are creative. They brew a black IPA a combination of an IPA and a porter, an Indian Cream Ale which is a cross of an IPA and an Irish Cream Ale, and a Four Conifer Beer, which version of the traditional spruce beer. It is brewed with branches of spruce, pine, cedar, and fir. And, of course, the Rosée d'hibiscus, which they describe as "a soft spoken wheat beer. The rose colour comes from the hibiscus flowers added during the brewing process. The aromas and flavour of this tropical flower are very prominent in the beer, giving it a slight acidity and a very agreeable fragrance. It is the perfect thirst quencher on a hot summer day. It was first brewed by the company in May of 2006. This beer won a gold medal (fifth place amongst 10 gold medal winners) at the adjudicated "MBeer" contest during the Mondial de la Bière in Montréal in 2007, and a silver medal in the 2008 Popular Beer Contest during the Mondial de la Bière in Montréal. 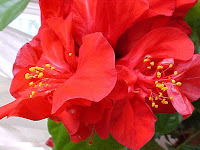 I wondered what a hibiscus flower looked like. The great picture below I "borrowed" from off the web from Yvonne Forsling's website. Time to crack it open and give it a try. It does pour a rosé colour and is cloudy as it is a bottle conditioned beer. The fragrance of hibiscus comes through. There is a head which forms on the beer but does not hold. The spice and hibiscus comes through strongly in the taste. The beer finishes with a long sour note. This is a well-crafted beer but not one I would have often. It says it is delicious on a hot summer's afternoon. Hey, we have one of those today. Time to sit out and try the next bottle! Hey Yvonne. It's fixed! By the way, it was the best shot of a hibiscus that I could find. Great camera work!